A UK-based renewable energy company has received a $61 million grant from the Australian government to build the world’s first utility-scale wave power project. Ocean Power Technologies will begin construction of the 19-megawatt project in the waters off Victoria in 2010. The project will provide enough electricity to power 10,000 homes. Wave technology uses buoys riding up and down on waves to drive an electrical generator, and then sends the power ashore via underwater cable. The project is part of a larger $218 million government investment in renewable energy that officials say will help Australia meet its goal of generating 20 percent of its electricity demands with renewable sources by 2020. The other projects receiving government funds include two geothermal projects and a mini-grid that coordinates wind, solar, biodiesel and storage technologies. This piece originally appeared on Yale Environment 360. Converting sunlight to electricity might no longer mean large panels of photovoltaic cells atop flat surfaces like roofs. Using zinc oxide nanostructures grown on optical fibers and coated with dye-sensitized solar cell materials, researchers at the Georgia Institute of Technology have developed a new type of three-dimensional photovoltaic system. The approach could allow PV systems to be hidden from view and located away from traditional locations such as rooftops. Researchers at the University of Bristol, UK, have found that nanoparticles can damage the DNA of cells, even when the cells seem safe behind an impassable barrier of tissue. Their experiment used 30-nanometer-wide beads of cobalt-chromium nanoparticles, which are not currently being used in any treatments, experimental or otherwise. The tissue barrier was made of human cancer cells, about four cells deep, and the “target” cells on the other side of the barrier to the nanoparticles were human fibroblast cells, found in skin and connective tissue. After a day in a lab dish, DNA damage was discovered in the fibroblasts. It wasn’t extensive, but included single and double-strand breaks in DNA, and abnormal chromosome doubling in some cells. Careful checking found no leaks in the barrier, and no cobalt-chromium beads on the wrong side of it, so the nanoparticles didn’t actually pass through the barrier to damage the DNA. Instead, the nanoparticles were able to directly influence the nearest layer of barrier cells and disrupted their mitochondria – chambers where energy is generated and stored – which released signaling molecules (ATP), which in turn triggered a cascade of biochemical messages inside the cell. That signaling storm eventually reached the other side of the barrier cell, opening channels that spread the message to the next layer of barrier cells. The process continued until signaling molecules reached the fibroblasts, somehow damaging their DNA – the researchers don’t yet know how this happened. By controlling light conditions, electrochromic smart windows can save costs for heating, air-conditioning and lighting and avoid the cost of installing and maintaining motorized light screens or blinds or curtains. A disadvantage is of course the fact that the smart windows themselves need to draw energy in order to do their job. Now, researchers at National Cheng Kung University in Tainan, Taiwan, have developed a self-powered, fast-switching smart window that doubles as a solar cell, using sunlight to power its chromic behavior and making the case for energy savings even more compelling. 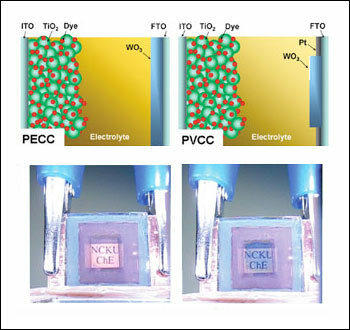 By employing a patterned tungsten oxide/platinum electrochromic electrode and a dye-sensitized titanium dioxide nanoparticle photoanode, the self-powered photovoltachromic cell (PVCC) which exhibits distinct electrochromic characteristics of a fast switching rate and tunable transmittance under illumination. The novel device has both photoelectrochromic and photovoltaic characteristics.